The question of whether jockey Josh Parr could have had done more to place beaten odds-on favourite Roheryn closer in the run is at the centre of an adjourned inquiry into the opening race at Rosehill on Saturday. Roheryn was sent out the $1.50 favourite in the 2019 Membership Sprint (1100m) on the back of an explosive win over 1200m two weeks earlier but found himself last and some nine lengths off the lead in the middle stages as the winner Chess Star rolled along in front. 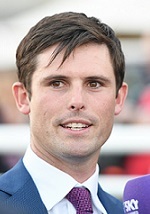 Racing NSW chief steward Marc Van Gestel was concerned that Parr didn’t appear to making visible efforts to improve his position on Roheryn when the pace steadied in the middle stages. Parr said he felt the speed was considerable and that the Godolphin colt was off the bit a fair way out and almost at his top coming to the turn. Roheryn ran his last 600m in 32.35 but could only get within a couple of lengths of all the way winner Chess Star in a time of 1:03.64 which is a bit over a second outside the course record. “He began reasonably well but it was evident a few strides later he wasn’t able to run the speed,’’ Parr told stewards. “I had Glyn Schofield on Beidi to my inside and hew was quite determined to hold a spot one off the fence so I elected to go behind and follow pretty early, simply because he wanted to hold that spot. During a lengthy inquiry, Van Gestel asked Parr whether he should have put Roheryn under some pressure earlier to which the jockey said he felt making a run from the 800m would have been detrimental to his chances. He said had he known the early speed was going to be as fast as it was he’d have held his line outside Beidi and waited for that horse to “weaken out of the battle’’ and therefore settle closer. “I was trying to keep in touch with the field the entire race,’’ he said. “It may not look like I’m encouraging the horse forward but I’m certainly not doing the opposite. “The speed they ran was fast. I’d be a fool to think he was going to bounce off the mark and improve quickly but I was confident over a period of 400m I could run the leader down who I thought had to be vulnerable. Chess Star finished the race with 33.31 for his last 600m, he’d run 11.22 for the 800m-600m and that’s the point where Van Gestel suggested Parr had an opportunity to improve. Trainer James Cummings said he’d have been disappointed in the jockey if he had attempted to make an 800m run on Roheryn. He said it was his belief Roheryn ran just as well as he did two weeks earlier, when a four length winner over 1200m. On that day Roheryn ran his last 600m in 33.48 in a 1200m race run in 1:10.62. “The pace of the race didn’t suit him today and from my perspective Josh rode the horse like he did last time,’’ Cummings said. “At six furlongs last start he was able to be in touch. “The horse goes out $1.50 and that’s probably why we are here. We beat Ronstar four lengths last time, beat him two and a half today. “We met a better horse who had trialled against Redzel and Pierata. Chess Star was the horse to beat, he’d be out in front and run fast and it’d be up to the horse to run him down. “Am I disappointed I didn’t win? I’m always disappointed when I don’t win. Am I having cross words with Josh when he gets off the horse? Not really I can see Josh is disappointed. “I think the horse ran as well as he did last time. It’s not Josh’s fault or my fault or Roheryn’s fault that the public put him up $1.50. Van Gestel said it wasn’t unreasonable for Roheryn to be installed favourite for the race based on his last win. The inquiry has been adjourned to a later date for stewards to “assess all aspects of the race’’ and examine the betting.